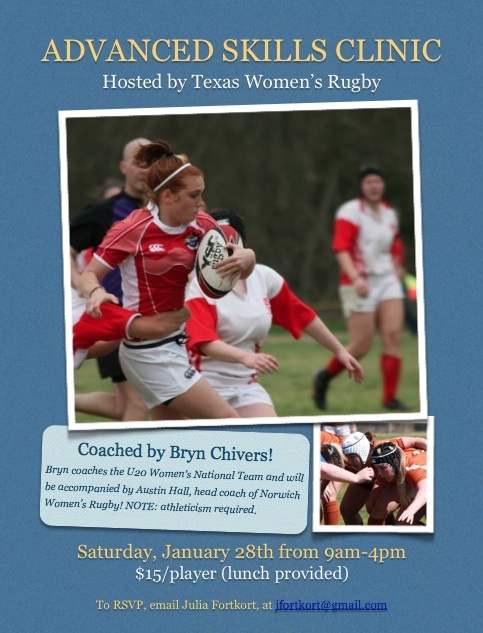 Advanced Skills Clinic hosted by Texas Women’s Rugby! This is an official invite to our second annual Advanced Skills Clinic! It will be held on Saturday, January 28th at Whitaker Fields (the UT Intramural Fields) located at the intersection of 51st and Guadalupe in Austin, Texas. It will begin 9am Saturday morning and will go until about 4pm. The clinic will be guest coached by Bryn Chivers, accompanied by Austin Hall. Bryn and Austin coach the U20 Women’s National Team and have offered to come to Austin to help us get to the next level in improving our more advanced skills. We welcome players of all experience! There will be a $15 player fee which will include lunch. Please RSVP no later than Wednesday, January 25th! If you have any further questions, feel free to email me!